If you're planning a trip to Puebla, be sure to leave some room in your carry-on for some Talavera pottery. You'll definitely want to bring some home with you! 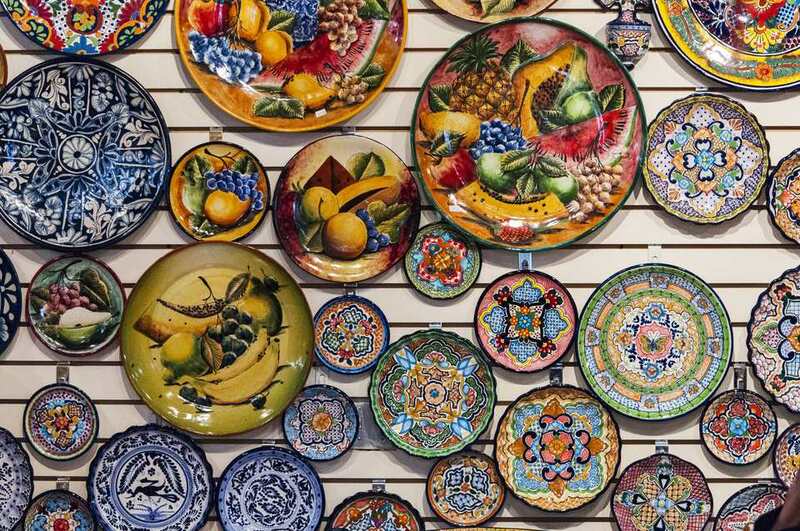 Talavera Poblana is a world-renowned hand-painted pottery that comes in various forms, including both functional and decorative items such as plates, serving dishes, vases. and tiles. Puebla is sometimes called "The City of Tiles" because of the Talavera tiles used on the buildings. This Mexican craft is a tin-enameled earthenware (Majolica) made in the state of Puebla. And besides buying it, you can also have the opportunity to see how it's made. This is one of the top things to do on a visit to Puebla. The native people of Mexico had a long tradition of making pottery. With the arrival of the Spaniards the contact between these two traditions resulted in exquisite new styles, the Spaniards introducing the wheel and tin-based glaze and the native Mexicans providing skilled labor and ingenuity. It is believed that the particular techniques for making this type of Majolica pottery were introduced in Puebla by immigrants from Talavera de la Reina, Spain. In 1653 a potter’s guild was formed and ordinances were laid down regulating the production of Talavera. Between 1650 and 1750 the production of Talavera was at its height. Originally, Talavera was white and blue. In the 18th Century new colors were introduced and green, orange and yellow began to be used. The basic process for making Talavera has remained the same since the 16th Century, though there have been changes in the shapes of pottery made and the style of decoration. Talavera pottery is made with two kinds of clay, a dark clay and a light, slightly rose-colored clay. Both of these clays come from the state of Puebla. These two clays are mixed together, strained and kneaded. Each item is modeled by hand, turned on the wheel or pressed in a mold. The pieces are then left to dry between 50 and 90 days, depending on the size of the piece. Once dry, the pieces go through a first firing and then are hand-dipped in a glaze which will form the white background of the design. Then, stencil designs are dusted onto the pieces with charcoal powder. Each piece is hand-painted and then fired for a second time at a higher temperature. Authentic talavera can be distinguished from imitations by the raised design and high gloss of the surface finish. In 1998 the Mexican Government set up the Mexican Talavera Regulatory Council (Consejo Regulador de Talavera) which regulates the production of the craft and limits the use of the term to pieces created within the designated region of Puebla which includes the districts of Puebla, Cholula, Tecali and Atlixco. There are fewer than 20 workshops producing authentic Talavera. In order to be certified these workshops have to pass an inspection and verification process every six months. You can buy talavera in many places throughout Mexico and internationally, but one of the few places where you can see it being made is in Puebla. There are a few different workshops that offer tours, including Uriarte Internacional, located in Puebla's historical center at 4 Poniente 911, (222) 232-1598. Workshop tours from Monday to Friday 9 a.m. to 5 p.m. Or at Talavera de la Reina, which is in San Andrés Cholula, on the way between Puebla and Cholula. Uriarte Internacional has a showroom in Puebla at the address above, and a store in Mexico City in the upscale Polanco area, at Alejandro Dumas 77. Fonart is a chain of stores operated by the Mexican government to promote the sale of folk art and crafts. They carry good quality pieces. In Mexico City at Juarez 89, Centro Historico. 5521-0171 and several other locations throughout Mexico. See Fonart locations. Authentic Talavera can be pricey, as every piece is unique and of excellent quality. There are imitations: only a few workshops which are authorized to make official Talavera, and make it in a way that has remained the same throughout generations, but when traveling through Puebla and surrounding states in central Mexico, you can find cheaper versions of the same type of work. Original Talavera will have the name of the workshop signed at the base of the piece and will come with a DO4 certification number.